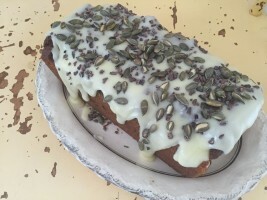 I fell in love with pumpkin loaf (really a cake) in America but had never made my own. Feeling a bit like my American boy was being deprived of his birth right, I decided to have a bash at making it with my boys. There are tons of recipes but one was speaking to me more than the rest…the kabocha, olive oil and bittersweet chocolate cake from the Gjelina cookbook. My last teaching trip to California fell in early October. So I was assaulted with pumpkin spice at every turn. In principle, the mixture of pumpkin, cinnamon, ginger and nutmeg is a good thing, but things have got a bit crazy stateside and I feel like that spice mix is in everything – body lotion, lattes, granola, candles, air fresheners. It has even started to appear over in England in coffees at a certain chain. We’re not yet at peak pumpkin spice here so I’m keeping my fingers crossed that it stays that way and we can just enjoy it as it is meant to be – in pies and cakes. The chaps at Gjelina recommend you roast kabocha squash before pureeing it and then straining it through cheesecloth overnight. I can imagine that you’d get a slightly smokier, roasty flavour from doing that, but having read a Bon Appetit magazine taste test of home roasted and pureed versus canned pumpkin puree (the canned stuff won the taste test) I will happily take the cheat option. 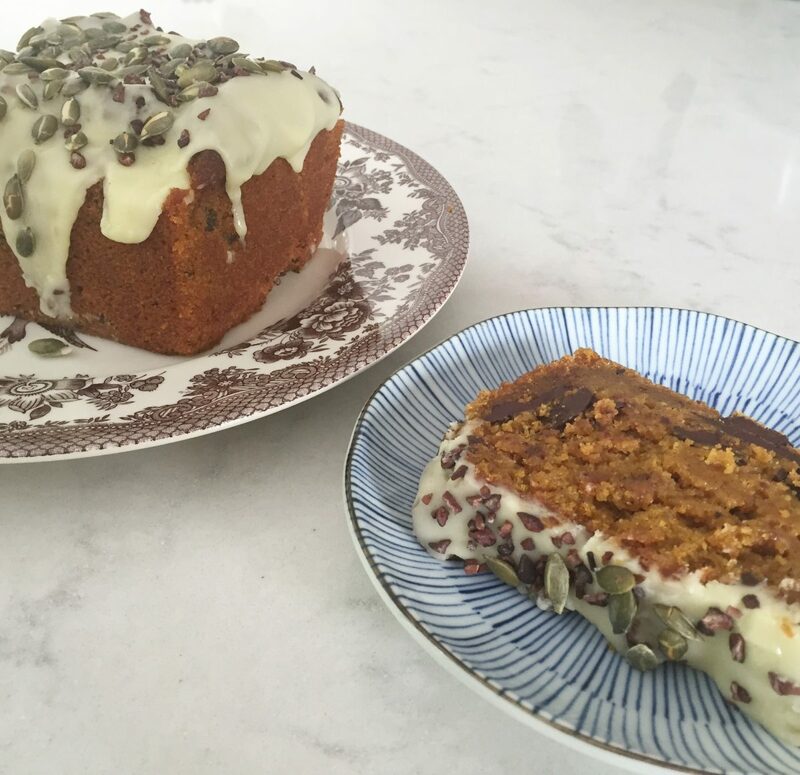 By using canned pumpkin puree you’ll be able to mix this cake together in less than 10 minutes – and I know that will make it much more appealing to make for most of us. American readers will need no instruction on what canned pumpkin is, but in the UK it is a still a bit of an unknown ingredient. It is easy to buy online and I’ve bought it at Tesco and Waitrose but it isn’t always in stock. Ask for it as it tends to appear in strange parts of the shop – sometimes with the baking things and sometimes with the baked beans! Be sure to buy 100% pumpkin with no added sugar or anything else. One part of the recipe that some of you may not be feeling is the addition of olive oil in the sweet glaze. Trust me, it is amazing and is what elevates this cake beyond the pumpkin bread you may have had before. The popped pumpkin seeds and cacao nibs are also perfect to balance out the sweetness elsewhere. You can find cacao nibs in most health food shops – they are chopped, raw cacao beans and as they are unprocessed they don’t contain any sugar. On their own they’re quite bitter but with the sugar of the cake and glaze they work really well. If you can’t find them, just use chopped dark chocolate. Because this cake is made with oil rather than butter it is very moist, verging on damp. No bad thing in my book, but if you are expecting a fluffy light sponge cake texture you’ll be better using a recipe that has butter creamed with sugar as a base. If you don’t bake regularly, be sure to check that your baking powder and bicarb (baking soda) are in date. If they aren’t you won’t get the required rise to your cake. Where I live in Cheshire we’re surrounded by rapeseed fields so I use Calvia, our local rapeseed oil. The lovely thing about rapeseed is that the plants not only produce this heart and brain friendly oil (which is lower in saturated fat than olive oil and can be used at high temperatures), but the flowers encourage bees. Rapeseed is known as canola oil in the US – just be sure to buy a non-gmo one if you’re over there as most canola oil is modified in the US. 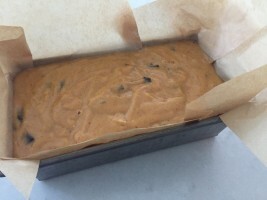 This cake is made in a loaf tin but I’ve also made it in a shallower brownie tin – just cut the cooking time if you’re making it in a shallower, wider tin. 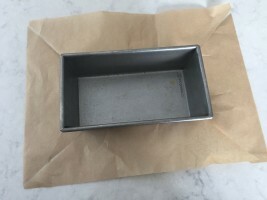 Preheat the oven to 165°C (325°F) and use parchment to line a 23 x 12cm (9 by 5 inch) loaf pan. If you want your cake to be shallower you can use a 23cm (9 inch) square tin that is at least 5cm (2 inches) deep. I line my pan by putting it on the parchment then cutting a diagonal to each corner. Then I put the paper inside and press it into place. You don’t need to rub the parchment with oil or butter. Put your flour, spices, salt, baking powder and bicarbonate of soda (baking soda) into a large bowl. Use a whisk to mix it all together. In a separate bowl, weigh your oil and sugar then add your canned pumpkin and eggs. I weigh my oil as then I have less things to wash. Whisk these wet ingredients together until you have a smooth orange mixture. Use a silicone spatula to scrape the wet mixture into the bowl of dry ingredients and quickly whisk together. You don’t want to over-whisk or you’ll get a tough cake. Just mix until all the flour has been incorporated. With your chocolate still in the wrapper, bash it on the kitchen counter top. It will break into shards. You’ll get a mixture of sizes but you want them to be no bigger than an inch across. 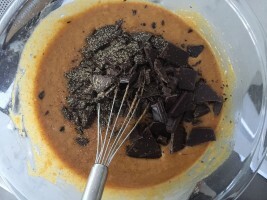 Open the wrapper over the cake batter then quickly stir the chocolate into the batter. Scrape the batter into your prepared tin and put in the oven. Ovens vary but I cook mine for 90-100 minutes in a loaf tin or 60-70 minutes in a square tin. Check yours 10 minutes before the end of the cooking time by putting a metal skewer into the middle of the cake. If there is any mixture sticking to the skewer, put the cake back into the oven and check it every 5 minutes. Once your cake is ready, take the tin out of the oven and leave the cake to cool in the tin for 20 minutes before lifting it out and leaving it to cool on a rack for about half an hour. To make your toppings, put your pumpkin seeds in a dry saucepan on a high heat. Shake the pan until the seeds start to smell toasty and start to pop like popcorn. Pour the seeds onto a plate to cool. Sieve your icing sugar (confectioners’ sugar) into a large bowl then use a silicone spatula to stir in the hot water. Mix until you get a smooth mixture then add the olive oil and mix again. Immediately spoon your glaze over the top of your cake, allow some to run down the sides – we’re after rustic here so don’t stress about perfection. 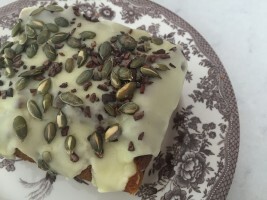 While the glaze is still wet, scatter the pumpkin seeds and cacao nibs over the top. Leave the glaze to set (about an hour) and then serve. Keep leftover cake in a cake tin. There is no need to put it in the fridge. I believe it will keep for about 5 days but mine has never lasted that long! You can also cut your cake in half before decorating it and freeze half, wrapped in foil, for another day. Find more recipes for pumpkin, cake, eggs, flour, sweet things and baking here. I’d love to see what you end up with, so remember to share this on my Facebook, Instagram or Twitter when you make it. Tag it #ystcook so I can see!